By garyw, April 14 in New to Boating? So. Given the nature of Brexit, and the fact that I reside in Spain, I think perhaps in 12 months or thereabouts, I will return to the UK. My family lives in the Eastbourne area, and I have decided to swap offshore boating for canal life. I'm surrounded by maps and other canal writings... but better to ask directly from those who know. Get a PROPER boat and moor in Eastbourne / Brighton Marina. Guildford (Surrey) is your nearest. Alan. Thank you. I have a Catamaran and the cost for mooring and maintenance in the UK are pretty outrageous, plus the change in status when (IF) Brexit ever happens will make euro travel a little irritating. I did consider relocating to Thailand but........... currently, the Thai government are in the midst of changing all the immigration laws. Need to wait and see. "If its not a cat it's only half-a-boat"
What Cat have you ? We have a Lagoon 380, currently in at Plymouth. Bought her back from Croatia a couple of years ago and kept her at Hull, but, no one can lift a 23 foot beam on the East coast so moved 'down South' last Summer. As the map shows if you want canal cruising the it has to be the River Wey but that is run and licensed by the National Trust and to get from there to any canal but the Basingstoke you need an EA Thames license . Then a CaRT one for canals so maybe not a cheap option. The Basingstoke also has its own licensing. The closer to London the more expensive the moorings are likely to be. 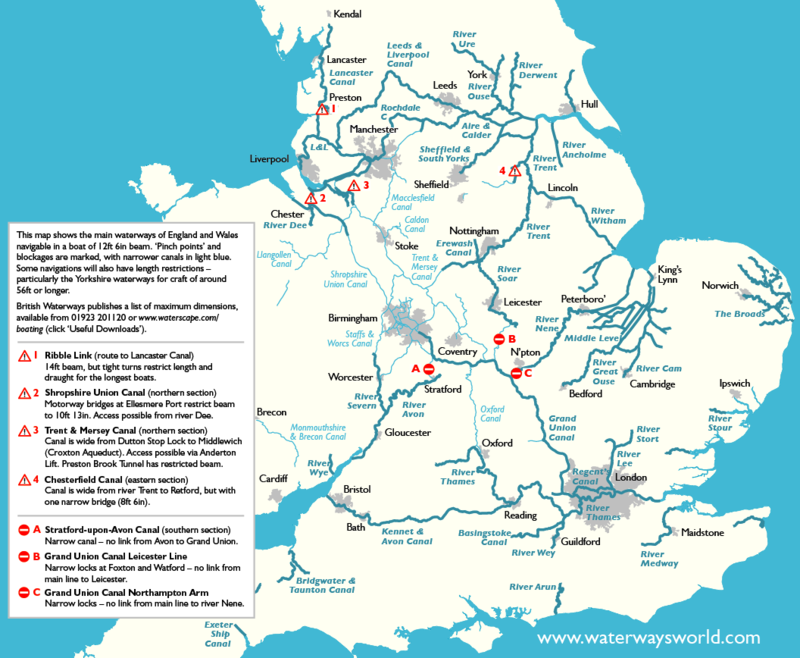 I know many boaters in our marina near Napton travel from Devon, Cornwall and all over southern England. Its till works out cheaper overall then getting a mooring in the south and you only have the CaRT license unless you visit an EA waterway..
Ads you seem to have offshore experience then as long as any boat you get can be modified for the Thames Estuary then the Medway might answer but that all depends upon an estuary worth boat or one that can be made so. Narrowboats do make that trip but usually wait for tide and weather. Our Cat is French built (and was American registered - Delaware - to 'minimise' tax) so we have European wiring, but its not a problem just to buy a few travel adapters and leave them in the sockets. Inland Marinas can be more expensive than costal ones - we are paying about £2500 for our Cat in Plymouth and the same for our cruiser on the River Trent. Moorings in London run up to about £15,000 per annum for liveaboard (that's if you can get one). We were offshore boaters, the wife got a bit 'frit' when we had waves breaking over the fly-bridge so we went to the canals for a few years, but, with the problems developing on the canal sustem we now have a River cruiser and the 'offshore cat'. You'll never get the salt out of your blood. yep... 110v and 230v is a different problem. 54ft narrowboat in marina near Napton a shade over £2000 a year. In a Thames marina in Reading when I last looked between £5000 and £7000 as year plus extra cost of an EA-CaRT gold license for using both systems. For goodness sake study the CaRT guidelines for continuously cruising and the related court cases. Also make sure you understand that you are limited to 14 days mooring in one location on Cart waters UNLESS it is signed as less and that can be as short as 1 or 2 hours but usually 24 hours, 48 hours or 7 days. Some places have a no return with 30 days and so on. Quite - apologies I was thinking that you were looking to bring the Cat over to the UK. I looked at bringing a big Bayliner over from the states - the wiring was a pretty easy fix - all the 110 appliances could be run from a 'builders' 230v to 110v transformer (one of those yellow 'bricks' used on building sites). Much easier than buying new microwave, washing machine etc etc. Napton seems reasonable. I will be living on the vessel in the main... and was aware of the 14 day rule... will now locate and download the relevant guidelines and study... Its Easter here in Seville or La Semana Santa.. a week of processions and noise...so a good distraction. Ask Calcutt Boats for te price of a berth in their Locks marina, its a bit cheaper then their newer one. However it will require a taxi from Rugby, Leamington Spa, or Banbury Stations. Just to say thank you for the quick responses. I reside in Spain and am SERIOUSLY considering the canal life if Brexit ever happens. I'm also a moderator on http://www.cruisersforum.com/ and have been for several years. If this happens, it will be a marked departure from my normal sailing experience. Somehow canal life has attracted me for life quality and the slower pace... I usually take between 8 and 23 flights a year to Asia for work and it does get hectic. If you need access to family in Sussex, and would like to be on a boat in reasonable reach of Eastbourne, May I suggest the canals and waterways of northern France? Probably cheaper and less regulations than the UK, and Brexit will have less effect on your movements than you think. From my knowledge of working in Europe, Brits will be limited to 3 months of European visitation after leaving the EU. That is what info has been filtered here to Spain if a person does not have a Spanish residency... The way it is going.. UK may not leave the EU at all... lol. I wish to live onboard... France really appeals. From your post, I infer that your only real option is to put your boat in a marina - it's not very practical / sensible to leave a boat on the cut unattended for any real length of time. Given that that there's no canal that near to LGW, then how about a marina on the Thames - quick access to LHR via cab. Yep. I will have to work through the logistics. Before we were in what was then the Common Market, I worked in France for a whole academic year, October to July. I don't recall having to apply for any sort of residential documentation. ...and yes, the French waterways have great appeal! The EU has stated that each Brit visiting Europe after departing, will have to purchase a "visa exempt" permit at the cost of €7:50 for 3 years. This is time limited to 3 months in any 12 month period. This will be linked to the passport and obviously be tracked and matched to a departure. This is what we have been told anyway. Interesting info; but how will the thousands of Britons who work in mainland Europe cope? Will they all be sacked? That does sound unlikely. That was then (and is now), but won't be the same if this Wrecksit thing goes ahead. It will be 90 days in any 6 months, with the 6 month period starting from the date you first enter France (or the Schengen area anywhere) so you can't even do 180 consecutive days in 12 months. I think for now, I will concentrate on the UK canals simply because that can be accomplished until the divorce from Europe settles into a proper agreement. When I made my comment, I hoped that you might see it and give the benefit of your first-hand knowledge, thanks for doing so. So, it's not as good as I hoped but not as bad as Gary feared.